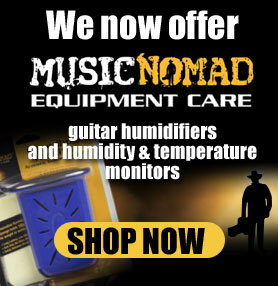 We now offer these Music Nomad guitar humidifiers and humidity & temperature monitors…Get one while supplies last. Protecting your string instruments just got easier. 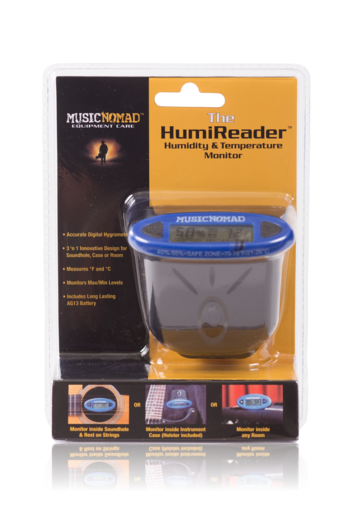 Music Nomad, the leader in equipment care products, has developed the HumiReader a patent pending Hygrometer humidity & temperature monitor that is accurate, reliable and easy to use. 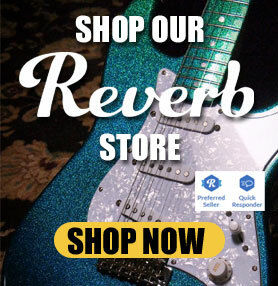 Perfect for Acoustic Guitars, Electric Guitars, Mandolins, Ukuleles, and Orchestral Strings. Monitoring your instrument’s environment is critical to ensure it stays within the manufacturers warranty and to protect your prized instrument from drying, warping, shrinking or cracking. 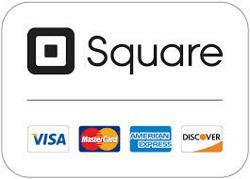 Our innovative design allows you to customize where you want to measure. In the acoustic guitar soundhole!? No way, YES WAY! Inside the case near the headstock or fretboard/fingerboard!? No problem. Or just place it any room you want to monitor. 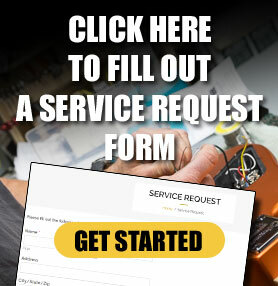 That’s Music Nomad quality – raising the bar in the equipment care industry. Acoustic guitar wood needs moisture to play and look its best. A dry guitar can warp, shrink and worse yet, crack! MusicNomad, the leader in equipment care products, has developed an easy to use, no mess, and low maintenance guitar humidifier. 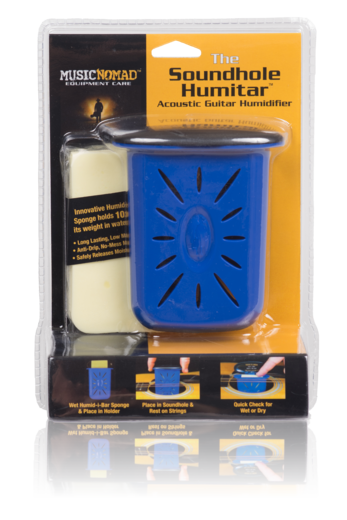 The Humitar safely releases moisture evenly to eliminate these potential problems. Our innovative Humid-i-Bar sponge holds a lot more water than our competition. 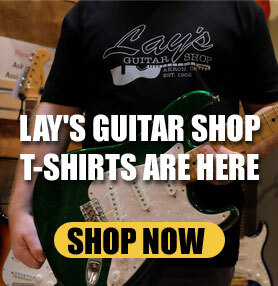 This means less monitoring on your end while resting assured your fine guitar is being cared for. Time to check the Humitar? Easy! Pop the top, touch the insert; if it’s wet leave it, if it’s dry, it’s time to rehydrate. Rehydrating is a cinch – simply remove the Humid-i-Bar sponge, soak it in distilled water and you’re back in action – easy no mess and low maintenance. String instrument wood needs moisture to play and look its best. Dry wood can warp, shrink and worse yet, crack! 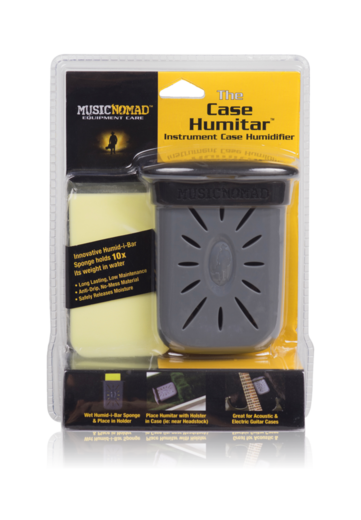 Music Nomad, the leader in equipment care products, has developed an easy to use, no mess and low maintenance instrument case humidifier, The Humitar. It safely releases moisture evenly to eliminate these potential problems. Works great for Acoustic Guitars, Electric Guitars, Semi Hollow Guitars, Mandolins, Cellos and other large case instruments. Our innovative Humid-i-Bar sponge holds a lot more water than our competition. This means less monitoring on your end while resting assured your fine instrument is being cared for. Time to check the Humitar? Easy! Pop the top, touch the insert; if it’s wet leave it, if it’s dry, it’s time to rehydrate. Rehydrating is a cinch – simply remove the Humid-i-Bar sponge, soak it in distilled water and you’re back in action – easy, no mess and low maintenance.